Australia’s agricultural supply was vital to Britain’s war effort. Contracts were secured to supply wool, wheat and meat to Britain. While primary producers prospered; there were shortages and price increases for many consumer goods in Australian cities. 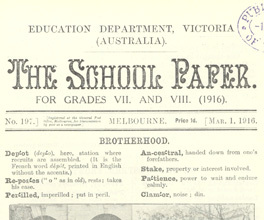 The History Teacher's Association of Victoria (in conjunction with the Department of Education and Training) publishes Agora four times a year. Soon after the war began, women and girls were knitting socks, scarves and balaclavas, for the soldiers. They knitted at home, on trams, in churches. When they ran out of knitting needles, they made new ones from bicycle spokes: when they ran out of dye, they used onion skins and wattle bark; when they ran out of wool, they learnt to spin their own. Bassett, J 1983, The home front, 1914-1918, Oxford University Press, Melbourne, Vic. These ‘busy bees’ and fundraising drives were only the brighter side to many tensions at home. Most of these could be traced to a growing casualty list and the conscription debates. With numbers steadily falling after 1916, recruiting efforts became more aggressive. Women offered to enlist and embark overseas for military service. The Australian Women’s Service Corps were prepared to serve in England and France as drivers, cooks and clerks. This would allow the men in these roles to fight on the front line. Their offer was not taken up by the Australian Department of Defence. As much as many women wanted to take a more active role in contributing to the war effort, conservative social attitudes saw little progress made in terms of equality. Only female nurses served overseas - female doctors were not enlisted despite many applications. Some bypassed this sexism and paid their own fares to travel overseas and enrol in services like the Scottish Women’s Hospitals. Female participation in the workforce did increase during this time but mainly in clerical and service sectors. Germans living in Australia were interned, as were men and women from Turkey, Austria and Bulgaria. Around 7000 were sent to camps where they ate war rations and worked on the country’s railways, roads and bush-clearing. When news of the armistice reached Australia late in the day on November 11, 1918, celebrations in Melbourne were exuberant. The streets of Melbourne were thronged with crowds who climbed on trams, waved flags and made as much noise as they could with songs, firecrackers and musical instruments. The Australian’s first action in France at Fromelles would also be among their most costly with more than 5000 casualties. Australian men answered the call to war with a sense of adventure, duty and enthusiasm. For those who survived the war, initial relief gave way to a new set of problems.